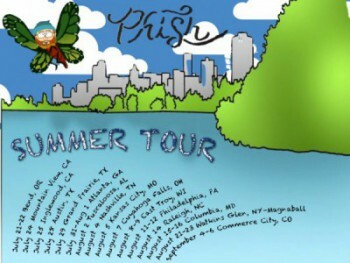 Start packing your bags, it’s time for Phish summer tour 2015! After wrapping up the epic Fare Thee Well shows in Chicago earlier this month, lead guitarist Trey Anastasio will hit the road with his beloved band, Phish, complete with bassist Mike Gordon, drummer Jon Fishman and keyboardist Page McConnell. The tour kicks off on the west coast with a two-night run in Oregon, and then the band plans to head southeast, stopping twice in both California and Texas before another two-night run in Atlanta. Next, it’s back towards the mid-west with shows in Tuscaloosa, Nashville, Kansas City, Ohio, and a two-night run in Elkhorn, Wisconsin. By the middle of August the band will head east again for two nights in Philly, a night in Raleigh, and two nights at Merriweather in Colombia, Maryland. To finish off the summer, the band introduces Phish Magnaball festival in Watkins Glen, New York, followed by a three-night Labor Day weekend run outside of Denver. Stay tuned as we cover regional highlights of the tour! Excitement overload! Lets bring some East coast love to close out the tour proper…. phish dicks y’all!